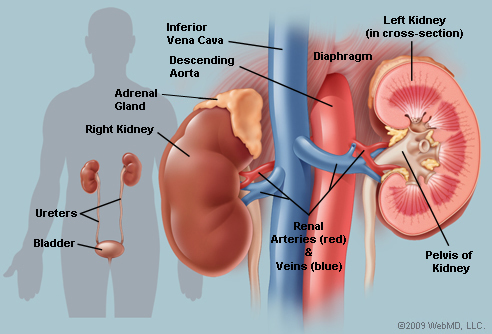 HEALTH – 10 Common Habits That Damage The Kidneys – footsteps…….. This is not about sports but about your body. Kidney is one of the organs in your body that needs attention because its the master filter for your body. I was sent this article through my email and i want to share for the benefit of everybody and sportsmen inclusive. This articla is NOT mine. The main functions of the kidneys are to regulate erythrocyte balances and eliminate metabolic wastes in urine. If we do not drink enough water, the blood will be concentrated and the blood flow to the kidney will not be adequate, thus the function of eliminating toxins in from blood will be impaired. 95% sodium we consume through food is metabolized by the kidneys. Exceeding the salt intake will make the kidneys work harder to excrete the excess salt and can lead to decreased kidney function. This excess sodium will cause water retention, causing edema. Edema usually elevates blood pressure and increases the risk of developing kidney disease. The daily salt intake should be controlled within 6g per day. Common infections, such as pharyngitis, tonsillitis, common cold etc, usually triggers or aggravates kidney damage. They do this by causing an acute attack of acute glomerulonephritis or chronic nephritis. So, you will see that people who get kidney disease for the first time or whose illness condition becomes worse usually present in hospitals with a history of cold or sore throat. Eating too much meat and protein can increase the metabolic load of the kidney. For those suffering from proteinuria, meat consumption too may aggravate protein leakage, worsening renal pathological lesion. This is equally as dangerous as eating too much, both of them will lead damages to your digestive organs where is full of mucosal tissues. Mucosal tissues relates closely to your immune system. This is why many kidney failure patients are diagnosed with “autoimmune kidney damages”. The use of analgesics for a prolonged duration may reduce the flow blood and greatly affect kidney function. In addition, patients with analgesic-induced renal failure are more likely to suffer from bladder cancer. >> Use analgesics only when it’s absolutely necessary, learn to rest instead of taking to the bottles. If you have been on pain killers for a long term, it’s about time you had a test to access you renal function done. Hypertension and diabetes have been shown to precipitate or accelerate kidney damage, so if you are diagnosed as having any of these disease don’t live your life in denial, USE YOUR DRUGS. Drinking alcohol without limitation may cause the deposition of uric acid in renal tubules, causing tubular obstruction and increasing risks of kidney failure. In our society, hypertension as a severe threat to life is largely due to stress. A common symptom of stress is insomnia. Blood pressure may increase by an average of 2-5mg/Hg because of insomnia. Chronically elevated blood pressure can cause damage to kidney capillaries giving rise to kidney problems. Thus, we need to develop a good attitude to life and strike a good balance between work and rest to protect your kidneys and live a healthy life. Next Post How Far Is 10,000 Steps?